Parasitoid Wasps Prey Primarily On? A "Poka-Yoke" Is A Design Feature Intended To Stop The User From? If we’ve learned nothing else from writing a trivia column, we’ve learned this: all people, at all times, should be thankful that insects are tiny and unable to prey on humans like the giant insects of mid-20th century sci-fi horror films did. Among the nightmare inducing class of predator insects that we’re particularly thankful are tiny are the parasitoid wasps: wasps that use the bodies of other creatures as hosts for their larva. Why “parasitoid” instead of “parasitic”? A parasitoid is different from a parasite in that a parasitoid’s life cycle almost always destroys its host while a parasite keeps its host alive. If parasites end up killing a host, it is almost always through a secondary and unintended mechanism like an infection. In the case of tape worms, for example, it is most beneficial to the tapeworm if the host lives a long and healthy life so that it can continue to steal nutrients from it. In the case of parasitoids, however, such as the species that make up the diverse group of parasitoid wasps, the goal is only to keep the host alive long enough for the larva to develop and leave the host—consumption of the host for energy is a vital step in this process. 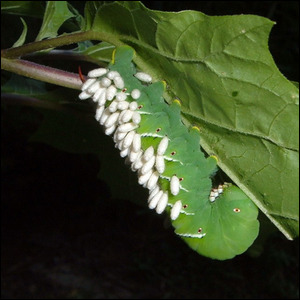 While some species of parasitoid wasps prefer prey like ants, flies, beetles, cabbage white caterpillars, white butterfly caterpillars, and even other wasps—the favored prey of the Cotesia congregata wasps are the larva (caterpillars) of the Manduca sexta (Order Lepidoptera)—creatures that provide a large and juicy target for their young to feed on. These diminutive and non-stinging wasps are a gardener’s best friend as they lay their eggs in the bodies of hornworms—those fat green caterpillars commonly found munching on garden tomatoes and other vegetables. The process is rather remarkable and isn’t just confined to the small wasps injecting their eggs into the caterpillars—with the young from those eggs growing up and bursting out later, like a scene from the movie Alien, then flying away. Not only does the wasp inject eggs into the host, it also injects a load of venom and a polydnavirus that hijacks the body of the host caterpillar with side effects that include: driving the caterpillar to eat more and fatten itself up, triggering an additional molting cycle to allow the caterpillar to grow even larger, suppressing the host’s immune system to protect the wasp larva, and even suppressing the caterpillar’s desire to move about in order to minimize any disturbance to the larva. Eventually, the larva emerge from the body of the hornworm, spin tiny little cocoons—seen in the photo here—and complete their transformation into adult wasps over the next 4-8 days. Image courtesy of Max Wahrhaftig.